Aiyisha + Seon Wedding Details, Details, Details!! Ok so it's Wednesday and you know what that means?!! Jersey Shore tomorrow night! I seriously love that show. It's my guilty pleasure; don't judge me! So I'm officially in editing mode from the Aiyisha & Seon's wedding I shot last Saturday. I ended up with nearly 2k photos from start to finish; insane! What I usually do to make the editing process not seem so daunting is I split up my photos in categories of four; Details, Ceremony, Portraits, and Reception. After going through the first phase of editing, there's a few detail shots I'd like to share. Plus blogging this post is a good excuse to take a break from editing right now ;). Soooo this is the gorgeous dress Aiyisha wore for her big day. As a matter of fact, the day I met Aiyisha for the first time to talk about her wedding was the same day she went wedding dress shopping with her girlfriends. I remember her telling me how she had found THE perfect dress and she was so excited :). And in case you were wondering what shoes she wore....BAM!! lol It was her something blue :). You can imagine how beautiful she looked for her wedding day. Ok, that's my time, gotta get back to editing. But stay tuned for more pics from Aiyisha and Seon's wedding day. 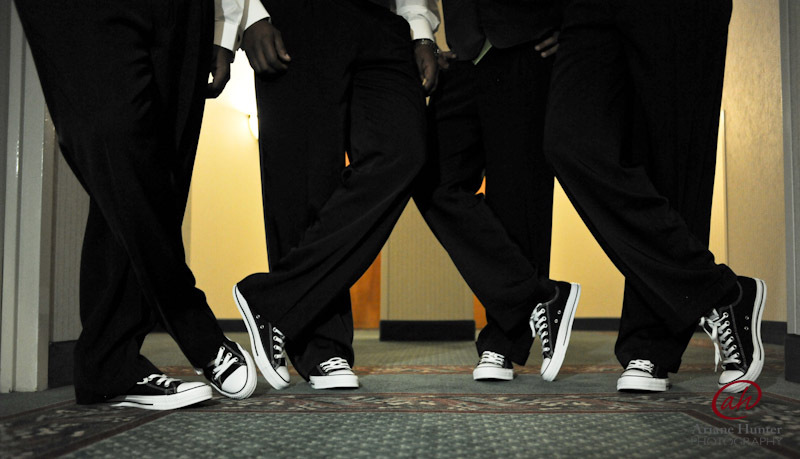 You won't believe what *err ahem* shoes Seon and his groomsmen wore! Ahhh what the heck, here's one more! How fun!! I'm so glad they wore these sneakers; livens things up a bit! Thanks all! More photos to come :).